Ages 5 through 10. Here is a collection of exciting game activities that can be used to help children develop auditory processing skills in the following areas: (1) Auditory comprehension; (2) Auditory memory; (3) Phonological awareness; (4) Auditory sequencing; (5) Auditory association. 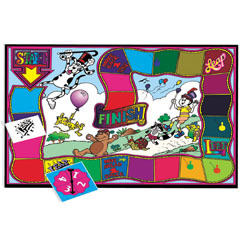 The kit includes a full-color, hard-back game board, task cards, spinner, and playing pieces.